An enchanting retreat designed for the whole family, The Magic Home overlooks the beautifully tended gardens and tennis court from its elevated position on the edge of the grounds. With two young children, our client wanted to create a special space within their garden for their family to enjoy together. Our brief was to design a truly enchanting treehouse with a range of surprising and imaginative features, which the family have now named The Magic Home. 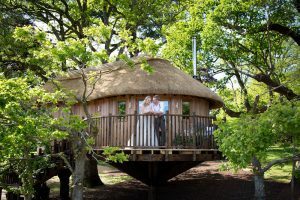 Close to surrounding woodlands and sporting an attractive turret roof line, the treehouse boasts a stainless steel tube slide and a zip wire that will keep the children entertained for hours. Aside from the traditional play features such as rope bridges and swings, The Magic Home also offers the children of the family a very unique play area of their own. A secret spiral staircase can be found hidden behind a revolving bespoke bookcase. The fairy-tale style staircase leads up to a cosy playroom with beautiful ceiling beams, a dormer window and glazed balustrade giving views down into the main room of the treehouse. Giant books have been stacked to one side to create a creative writing desk, and a moon light hangs down from the ceiling. You might think that a small wardrobe is an odd thing to find in a children’s secret playroom but just like the wardrobe in Narnia, if you open the doors you’ll discover the entrance to the tube slide which curves all the way round the treehouse to the sandpit outside. A truly unique space, the treehouse is also perfect for entertaining friends and visitors with a bespoke curved sofa which also acts as a comfortable bed. Standing in the centre of the living space is a contemporary de-barked tree support column with LED floor lights surrounding the base. A marble-top kitchenette allows for afternoon lunches or evening party canapes to be easily prepared from the treehouse, which can then be enjoyed on the decks outside. 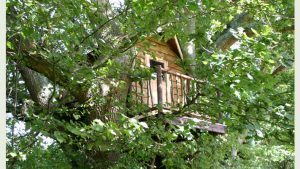 Sussex is home to this delightful cosy tree house overlooking the countryside. As its name suggests, just like a bird’s nest, it is nestled amongst the branches of a tree. Deer Park Hotel is a quintessentially English mansion dating from 1755 and is set within 80 acres of natural English countryside. It’s a popular venue for weddings in particular, with couples enjoying their special day with their friends and family in the most beautiful of settings. Blue Forest have recently completed construction of Birr Castle Tree House, the tallest tree house in Ireland. Standing more than 3 stories high, the treehouse is the centerpiece for a new adventure playground at Birr Castle, Demesne. Having a positive impact on the world around us is important, and we are proud to help support The Tongole Foundation, a charity that provides aid to local people in Malawi. Find out more about how we support them here.